Hatfield Town enjoyed a good start to their Pontefract and District League Division Two season as they claimed a 25-run win over Sandal. Matt Cockburn (38) and Connah Pattison (26) saw them off to a good start, which was backed up by Kev Marshall (70no) and Luke Cockburn (34) as Town reached 211-6. In reply Sandal always looked like falling short but made a good fight of things to reach 186-7. Marshall, James Stewart and Mark Walton were all crucial to Town’s win, taking two wickets each. Town were joined in their opening day Division Two win by Barnby Dun, who claimed an eight wicket win over Glasshoughton. Barnby Dun won the toss and elected to field first, and the decision paid dividends when Glasshoughton were bowled all out for 100. Idris Kahn (4-28) and Mark Nurse (4-20) did the damage for the visitors. And in response, Paul Dyke made light work of the chase, hitting 71 not out, with Michael Fell 16 not out. Meanwhile, in Division One, Askern Welfare were back with a bang as they recorded a 47-run win over Monk Bretton. Aaron Gillies opened with an impressive knock of 41 after Askern were put in to bat first, and Andrew Lunn contributed 32 as Welfare reached 163. In response, Monk Bretton were skittled all out for 116, with Josh Gillies taking 4-42 in the process. 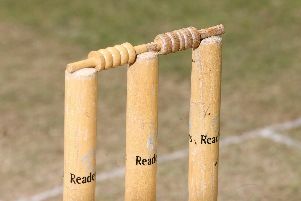 In Division Three, Brodsworth Main got the better of Rossington Main in their season opener, claiming a 45-run victory. Adrian Price got Brodsworth well on their way as he hit 77, as they managed 169 all out. Richard Morrall claimed three wickets for 53. In response, Scott Wood struck 41 for Rossington, with Jamie Kelly 24 not out. However, the visitors fell short with 124. Also in Division Three, Bentley lost by seven wickets to Kilnhurst Colliery, having been bowled all out for 107. Following promotion, Hatfield Town’s second team made a confident start to life in Division Five at home to Old Sharlston, winning by 65 runs. Put into bat first they reached 154-8 off their 46 overs with skipper Craig Pattison (34) top scoring and Chris Stothard chipping in with 22. Their opponents were soon in trouble with James Winstanley and Dave Whitehouse taking two early wickets each, before James Stafford and Chris Stothard joined in to see Sharlston all out for 89.